Groundbreaking sports activity impact indicator, the Reebok CHECKLIGHT™ Honored for High Design Quality in Sports & Fitness Category. Canton, MA - March 26, 2014 - Reebok today announced it has been selected as a winner of the Red Dot Award 2014 for the Reebok CHECKLIGHT™. The sports activity impact indicator, which launched in July 2013, was selected by a 40-member expert panel for the coveted design award in the category of sports & fitness. The Red Dot Award is considered one of the highest international honors in product design. Products are evaluated based on innovation, functionality, quality and durability. For the competition, international experts discussed and evaluated 4,815 entries from 53 countries. Only designs which won over the jury with quality and innovative strength were selected. The Reebok CHECKLIGHT™ was selected for the coveted Red Dot quality seal. Reebok CHECKLIGHT™ is a groundbreaking sports activity impact indicator designed for athletes of all ages and skill-levels and can be used in all helmeted and non-helmeted contact sports and activities. CHECKLIGHT™ uses multiple motion sensors to provide actionable impact data that helps identify athletes for assessment before continuing to play*. An easy-to-read display of red and yellow lights indicate the level of impact. The Reebok CHECKLIGHT™ is the first impact indicator that comfortably fits wearable electronics directly on the athlete, not on the athlete's protective equipment. The Reebok CHECKLIGHT™ brings together Reebok's deep expertise in creating functional and innovative sports and fitness performance products with state-of-the-art conformal electronics developed by Cambridge, MA electronics company MC10. 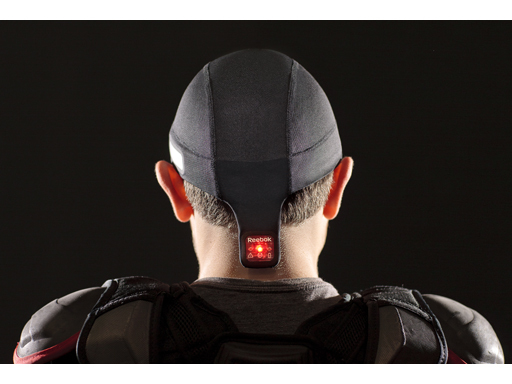 The flexible electronics are embedded into a closely fitting skullcap that accurately measure linear and rotational accelerations in real-time and help ensure that the product is comfortable and non-distracting to the athlete. "The 40 experts assessed the quality of the entries with the utmost care and attention," said Prof. Dr. Peter Zec, Initiator and CEO of Red Dot, about the decision process for the Red Dot Award. "Due to their backgrounds, they also assessed the special cultural aspects of the designs from 53 countries. But only the best products receive an award from the jury. This is especially reflected in the percentage of successful entries in the Red Dot Award, which is much smaller in contrast to other international design competitions. Therefore, the winners can be proud of their achievements – with their entries, they stood out from the rest and were able to pass the test in front of the critical eyes of the experts. This success will be perceptible during the Red Dot Gala, when the laureates will receive the recognition of the international audience." On July 7th, 2014, the honorees of the internationally renowned product competition will be celebrated in Essen, Germany including the presentation of the acclaimed Red Dot during the traditional Red Dot Gala and subsequent Designers' Night. That evening, approximately 1,200 guests from around the world will gather in Essen for the awards ceremony. During the ceremony, at the Red Dot Design Museum Essen, the winners' exhibition will be opened, presenting the award-winning Reebok CHECKLIGHT™ to a wide audience for four weeks before it enters the museum's permanent exhibition. "At Reebok, we are dedicated to bringing innovations to the market that will help people be fit for life," said Paul Litchfield, Reebok's Head of Advanced Concepts. "The CHECKLIGHT™ is a great example of this. More and more, people are beginning to understand the long-term ramifications of head injuries and it is our hope that we can help more people participate in, compete in and enjoy whatever fitness activity they choose – and do so for a long time." "We spend a great deal of time designing and creating products that are elegant and simple on the surface, but with a level of innovation and attention to detail that Reebok is known for and our consumers deserve. We're extremely proud that a product we designed is being recognized with a Red Dot Award," said Litchfield. The Reebok CHECKLIGHT™ is the first consumer electronics product launched by Reebok as part of an advanced research and development initiative to introduce wearable fitness technologies that will help people reach their fitness goals and stretch the limits of the fitness industry through technology. In addition to this honor, the Reebok CHECKLIGHT™ was also named an International CES Innovations 2014 Design and Engineering Awards Honoree and "Best Consumer Product" at the 2014 Wearable Conference and Expo London. In addition, MC10 was awarded 2014 Flexi Innovation Award for the Reebok CHECKLIGHT™ from FlexTech Alliance. With approximately 2,000 exhibits spread over an area of more than 4,000 square meters, the Red Dot Design Museum houses the largest exhibition of contemporary design worldwide. The award-winning products from the Red Dot Award: Product Design 2014 will be presented in an impressive special exhibition from 8 July to 3 August 2014. Since touching and testing is expressly encouraged in the hands-on exhibition, visitors experience the current best achievements at close quarters in "Design on Stage". *The Reebok CHECKLIGHT™ is not a concussion diagnostic tool – it provides an objective measure of impact force and is designed to lead athletes on a pathway to assessment.